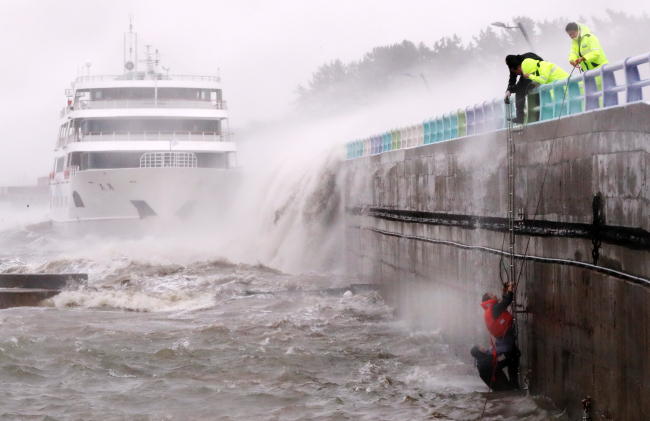 At least five people died and five more are missing after Typhoon Chaba swept through the lower part of the Korean Peninsula on Wednesday, the safety ministry said. 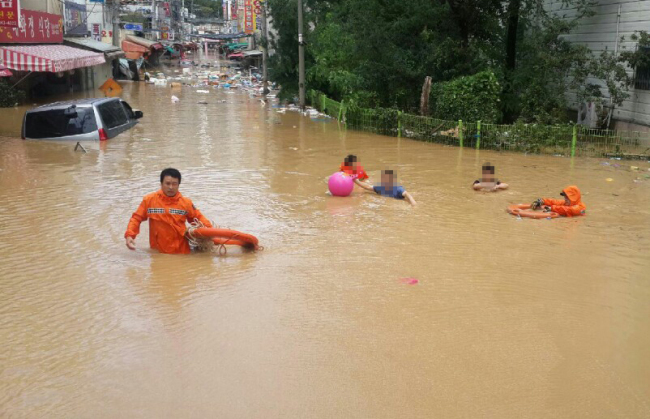 Jeju Island and the southwestern cities of Busan and Ulsan were most severely hit as the typhoon unleashed strong gusts of 47 meters per second and heavy downpours of as much as 600 millimeters between Tuesday and noon Wednesday. A tower crane collapsed onto a nearby container in a construction site in Busan, killing a 59-year-old man surnamed Oh, according to the Ministry of Public Safety and Security. A 90-year-old woman also died as she was pushed off from her house on the second floor by strong winds. On Jeju, a ship crew member fell into the water and went missing in the Jeju port on Wednesday morning, while in Ulsan, an emergency rescuer on duty was swept away by a flood. The toll is likely to rise, the safety ministry said. More than 120 flights were grounded due to the typhoon, stranding thousands of passengers. Jeju International Airport was shut down from 7 a.m. to 10 a.m., and all morning flights in and out of Gimhae airport, located on the side line of Busan, were canceled. The operation of high-speed KTX trains in the southern regions came to a temporary suspension at noon, as powers were cut due to the rainstorm. Typhoon Chaba knocked out power in more than 210,000 households around the affected region, according to Korea Electric Power Corp. Businesses based in the affected areas also saw damages. Hyundai Motor’s auto assembly line in Ulsan was halted temporarily due to flooding, while Daewoo Shipbuilding & Marine Engineering Co. on Geoje Island also faced suspension. The Busan International Film Festival, which is set to kick off on Thursday, is expected to face problems as the typhoon destroyed some of its venue sites, organizers said. 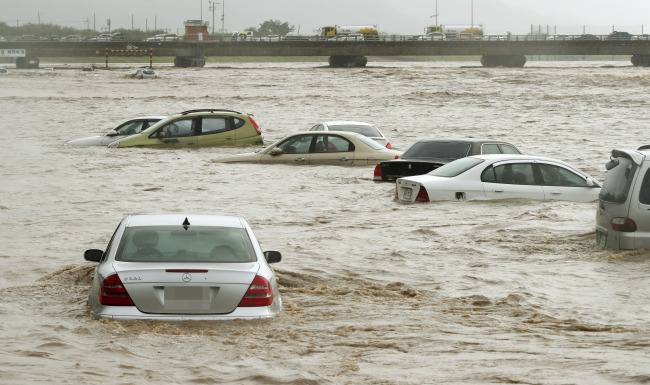 More than 1,400 cars were reported to be either waterlogged or hit by debris, with the cost of the damage estimated to be 10 billion won according to General Insurance Association of Korea. Local kindergartens, elementary schools and middle schools in Busan were temporarily closed due to the typhoon, according to media reports. 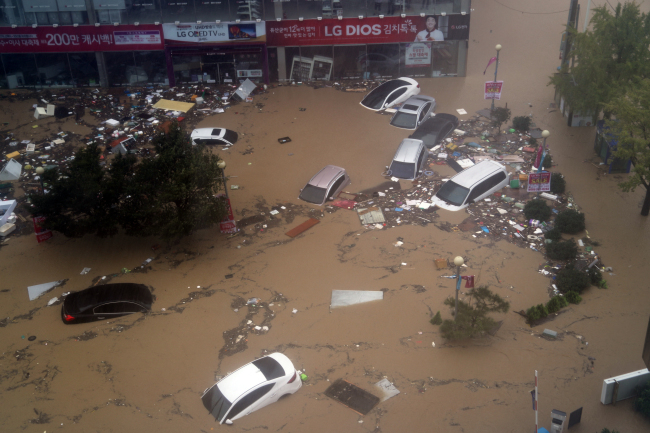 The nation’s financial body decided Wednesday to provide emergency support for those who suffer damage, while Deputy Prime Minister Yoo Il-ho said the government will decide soon whether to designate Ulsan and other heavily-affected areas as disaster zones. The weather agency lifted typhoon warnings issued for most of the southern regions by 3 p.m. Wednesday, as Chaba directed its way out of the country toward Japan.